Egypt's leading presidential candidate reveals there were two attempts to kill him, stresses he is not afraid. Abdel Fattah al-Sisi, the former Egyptian army chief who is expected to win a presidential election this month, revealed on Monday that there had been two attempts to kill him, Reuters reported. He did not say when the assassination attempts took place. 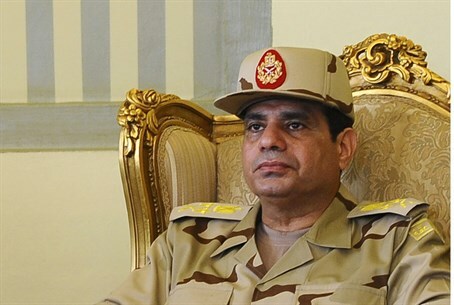 Sisi recently resigned as defense minster and announced his plan to run for president, saying it would be the last time he wears his military uniform. “I give up the uniform to defend the nation,” he declared. Sisi had taken the approval of the constitution in a January referendum as a vote of confidence for his presidential bid. He will be opposed by one candidate, Hamdeen Sabahi. The former army chief led the ouster of Muslim Brotherhood president Mohammed Morsi last July. Since that time, hundreds of Islamists have been placed on trial, and the Muslim Brotherhood has been outlawed and designated as a terrorist organization. Sisi has said his campaign would be unconventional - an apparent reference to concerns for his security, noted Reuters. So far, there are no announced plans for him to appear in public.